Half a century ago, thousands upon thousands of people from all across this country gathered in Washington, D.C. We all know this story—it was the March on Washington for Jobs and Freedom. 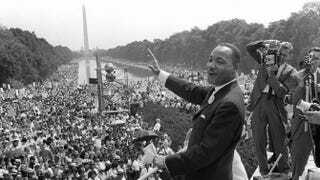 It was there that Dr. Martin Luther King Jr. uttered his famous words, "I have a dream." That speech and that march fundamentally changed America. They helped transform our democracy by exposing comfortable Americans to the truth that a grave wrong was being done. And that call for justice altered the landscape of the American mind. That change has been felt in America every day over the decades since, and it is at least partially responsible for clearing a path for Barack Obama to become president of the United States. King championed the workers’ cause. So much so that even on his last day on Earth he was organizing black sanitation workers in Memphis who were on strike for wage increases and union recognition. And in less than two weeks, when I listen to President Obama’s State of the Union address, I’ll be paying close attention to anything that signals a renewed focus for our working-class families. I want to hear about a new push for big changes to make meaningful gains possible in the lives of everyone. I want to hear about increases in the minimum wage, lowering unemployment rates by investing and creating good jobs, a plan on comprehensive immigration reform, protecting voting rights and other measures to strengthen this great country. But before we even address these goals we must immediately take action to extend unemployment insurance for the millions of Americans who want to work but cannot find a job. Because Dr. King went beyond the dream he had on that hot summer day in 1963, and he turned those dreams into action. The first action is that we continue to fight to ensure everyone has the right to vote. This is crucial to working people. Nothing builds our communities like working together, not only to elect candidates who support us, but to make sure that everyone can actualize their right to vote. The second action is to help more than 11 million people come out of the shadows. They cannot do that until Congress passes a comprehensive immigration reform bill with a path to citizenship. The system is broken, and U.S.-born workers as well as aspiring citizens are paying a heavy price for it. America needs to create an immigration system that works for working people—not a system that benefits corporations at the expense of everyone else. What happened last year in Congress should not happen again. The third action is putting an end to mass incarceration, also known as the new Jim Crow. Mass incarceration is a betrayal of the American promise. It's robbing too many of our youth—especially African Americans and Latinos—of a future. The for-profit prison pipeline hurts families and communities, it keeps wages low and it suppresses democracy, and we can’t afford to imprison so many people. The fourth is to increase the federal minimum wage to $10.10 and combat the income inequality that millions of Americans are facing. Let’s also stand with tipped employees, who only make $2.13 per hour and experience poverty at nearly three times the rate of the workforce as a whole. These low wages disproportionately affect women, young workers and people of color. Women make 77 cents on the dollar, as compared to men. People of color are still unemployed at higher rates than their white counterparts and younger workers are still unemployed or underemployed, with many facing the burden of student-loan debt. We must go beyond the minimum wage and ensure that no one who works for a living is struggling to support his or her family. This is why we in the labor movement are calling for the restoration of collective bargaining among millions of workers in the United States. Allowing workers to organize and bargain together can address growing income inequality in this country, by raising wages not just for union workers, but for all workers. As we observe this holiday, let’s reflect on King’s vision for a better tomorrow. Let’s recognize the tremendous progress this country has made and the great future this nation has if we continue to work side by side. We must continue to fight for his dream of racial and economic justice. It's the only way we can achieve equality and shared prosperity for all. Richard Trumka is president of the AFL-CIO, the country’s largest labor federation, representing 12.5 million workers. Follow the AFL-CIO on Twitter.